Kip Andersen is the executive director of Animals United Movement, a nonprofit dedicated to producing films and media promoting sustainable, compassionate, and peaceful living. He is the co-director of the groundbreaking documentary film Cowspiracy: The Sustainability Secret. Keegan Kuhn is an award-winning documentary filmmaker, video producer, and professional musician. He runs First Spark Media, a video production company tailored to creating videos and films for nonprofit organizations and conscientious companies. He is the director of Turlock: The Documentary and Something To Be Thankful For, and co-director of the groundbreaking environmental film Cowspiracy: The Sustainability Secret. Caryn Hartglass Let’s get on with the next part of the program because I think we’ve got a lot of material to cover and I understand my guests are on hold. So let’s move on to Part 2. And we’re going to be inviting Kip Andersen and Keegan Kuhn, the co-directors of the documentary Cowspiracy. They now have a new book out, The Sustainability Secret: Rethinking Our Diet to Transform the World. Welcome guys to It’s All About Food. Kip Andersen and Keegan Kuhn: Thank you. Caryn: Okay now Kip, I want to calibrate your voice. Can you say hi? Kip: Hi, this is Kip. Thank you for having us on. Keegan: Hey, this is Keegan Kuhn. Thank you so much for having us. Caryn: Oh, okay. I don’t know if I’m going to get that right, but I have that to calibrate later on. Kip and Keegan. So you’ve had some wonderful success with your documentary Cowspiracy. Congratulations. Keegan: Thank you so much. Caryn: And you had Leonardo DiCaprio producing it and that got it to Netflix? Something like that. Kip: Yes it did. It’s similar to how he did with Virunga. He got to deal with Netflix and he’s bringing environmentally based films to Netflix. And in our case, he was the first one to bring the film to Netflix, whereas Virunga, Netflix brought to him. And he watched it over a year ago and was blown away and he wanted to help out so he’s our executive producer for the Netflix release. Caryn: That’s wonderful, because it’s not easy to get on Netflix. It’s expensive and you need to work through some middle men to get there, right? Keegan: It’s definitely a challenge and so to have Leonardo DiCaprio take the film to Netflix was phenomenal. I couldn’t have wished for anything better than that. Caryn: So the interesting thing for me reading The Sustainability Secret: Rethinking Our Diet to Transform the World is it’s a personal thing. I’ve been vegan for 25 years. I’ve been vegetarian for a lot longer and I’ve spent most of my life in activism and I’ve lived through most of the things that you talk about in this book. It’s like a history book. And it’s really great for people to read who want to get up-to-date on this issue regarding eating animals and its impact on the environment and health and cruelty. All of those things. And so it was kind of chilling in some ways to remember when these things were going on. Frustrating on one hand that at the time that, some of the time, I was executive director of EarthSave International and working with Howard Lyman, you mentioned him in the book. We put out newsletters and I remember trying to get information or get other environmental organizations on board to talk about animal agriculture and it just wasn’t happening at all. And to reread that I—like I said—it was frustrating on one hand. On the other hand, I’m glad that it’s out there now and it’s getting so much more press and now we can really make some headway. So thanks for putting that together. Keegan: Well it’s a sad truth if that—these environmental organizations—many of the large environmental organizations are still failing to properly address animal agriculture culture as a leading cause of environmental degradation. But we are seeing some strides being made. We are moving forward and I think we’re going to see more and more organizations starting to talk about it, starting to address it properly. Because it’s absolutely essential. It’s the only way we’re going to see global sustainability be a reality. Caryn: Let’s talk about the beginning of the book. I love Chris Hedges and he wrote the foreword to your book. I was ecstatic when I learned that he became vegan, but also surprised that it took him so long to get there. And he talks a little about it in the foreword, but that’s kind of the profound thing about this food issue that some people who are so connected to the exploitation on this planet with so many issues on so many levels and have seen the worst of the worst, and yet when it comes to animal agriculture, they have the veil on. They’re unaware. Kip: Yes—it’s a tough thing. And—it’s essentially, our eating habits are essentially an addiction, whether it’s something that comes from our past of how we grew up. You have this bond with your family of how you grew up. Like myself, I grew up around the table and sometimes when you challenge someone’s eating habits, you’re challenging really their heritage and who they are. And so not only is it an addiction when you deal with say, dairy products, the casomorphine and the habitual thing of doing something every single day, whether it’s brushing your teeth in a certain way. It’s also tied to you know, your heritage. So it’s a really tough thing to overcome. But once—as you know—when you do, it’s so incredibly liberating. But it takes some time for some people. Caryn: Yeah, but Chris Hedges?! Caryn: For those who aren’t familiar with him, he’s an incredible journalist. And he writes so passionately about exploitation all over the world and he was a vegetarian too for a while, but not vegan. Keegan: Yeah. It is – it is a blind spot for a lot of uh — progressive people that they – they don’t look at the impact of their own oppressive behavior on others. I think Chris’ wife, Eunice Wong, had a lot to do with his transformation to a vegan lifestyle. And now they’re just a really powerful, powerful couple who are doing so much to raise awareness of justice on so many levels, including animals. Caryn: Yeah well I believe that once you realize hat you don’t need to eat animals to live and to live well and that we don’t need to exploit them, all the other exploitation issues become very clear. All of a sudden, you’re aware of all of them. Kip: Yeah it really does. Once you—for me in particular, like you said, the kind of domino effect of when I went vegan, how many things open up in clarity in your life of things that you are maybe not really living your truth. Or when you see people you know, say you’re doing yoga or some spiritual leaders are talking about some things, yet they’re doing other things. Everything just has more clarity to it and truth to it. That—just kind of light really turns on in so many subjects all across the board. That was really interesting going through that. Caryn: Well, you know you mention yoga. And we’ve imported the yoga exercise to this country and maybe a little bit of the meditation, but the full yoga practice involves a vegan diet. Kip: Yeah. I mean that’s why I say, a lot of people say, “Oh I’m a yogi” or a yoga teacher, and say they’re eating animal products. I’m like, “No you’re an asana teacher,” “No you teach asana practice,” which is a part of yoga. But to say you’re a yoga teacher or you’re a yogi, that incorporates all eight limbs of yoga and the very, very, very first one is ahimsa, nonviolence. And if you can’t get that part; in asana practice, that’s not until limb four. So you know, everything, the foundation of particularly yoga is ahimsa. So yeah, you’re right. Caryn: Okay, let’s touch on a bunch of things in this book and I think it’s not the central part of the book, but I think it was a clever piece and an important piece that got people interested in the movie, especially with your trailer. And that’s the exposé of the environmental groups who are not being honest, who are telling the truth about one of the most serious environmental disasters on this planet. Caryn: Yeah, let’s talk about that a little bit. Keegan: Yeah for many of the large organizations like Green Peace and Sierra Club, their focus is on fossil fuels. And when it comes to animal agriculture, they’re basically silent. There might be a few articles buried deep in their website where they mention the impact of animal agriculture, but they don’t address the real solution to it. But you would think that an organization who has their mission statement is to protect and save the environment, that personal lifestyle choices would be at the forefront of the issue. Or at least addressing the fact that animal agriculture is the leading cause of deforestation, species extinction, habitat loss, water consumption, water pollution, ocean dead zones. And literally the list goes on and on and on. So the fact that they’re not addressing it as a forefront issue is shocking and was a major focus of the film. Caryn: And—I mean we know that they weren’t focusing on it because they believed it would affect their bottom line. They wouldn’t be getting some of the funding that they needed to keep going, so they compromised. Kip: I was going to say one quick thing. Since the making of the film, we actually found it’s even worse. We saw—I don’t know if you call it a marketing report, but it was a big report that showed if we do—if these environmental groups do talk about animal agriculture and reducing meat consumption, will this be a win campaign? And they analyze whether it’d be a win campaign. And the conclusion was it wouldn’t. So they didn’t do it, which was unbelievable, which shows that they’re more concerned with the sustainability of their own – themselves – and not of the planet. They’re more concerned with profits over the planet and it’s just unbelievable. You know? Caryn: That’s incredible. Now I’m sure that some of them are ignorant and maybe it’s what you were talking about before because of how we’ve been brought up. People don’t want to see. I remember talking with one woman at Green Peace. And we were talking about refrigerants and their campaign to change a lot of things relating to hydrochloric carbons, things like that. And the woman I was talking to was vegetarian, but not vegan, and was clueless about the health impacts of dairy, the environmental impacts of dairy and the cruelty related to dairy. Keegan: Yeah, and it’s shocking. You would think that organizations whose focus is saving the environment would be extremely well-versed in all of the environmental ills facing the environment. And so some of them do seem to be ignorant, but it’s shocking. How could the executive director of an organization – of a rainforest organization – not know that animal agriculture is the leading cause of rainforest destruction? And so that’s where Cowspiracy is placed in is that are they truly ignorant or are they willingly avoiding this topic because it’s unpopular and potentially will hurt their donor base? And that’s the really disturbing conspiratorial aspect of this whole story. Caryn: There’s a lot of people that talk about palm oil and we definitely need to be talking about it. It’s an important subject and it has tremendous impact on the rainforest. And I’m glad that you brought up the Rainforest Action Network (RAN), in your book and talked a bit about it. But sometimes I think that they’re focusing on that because they don’t want to focus on the animal agriculture issue. Kip: Absolutely. Palm oil is a major issue and absolutely needs to be addressed, but Indonesian palm oil production has cleared about 26 million acres of rainforest versus animal agriculture’s about 136 million acres. Keegan: And RAN, their first campaign was against Burger King. You would think that would have been their – you would think it would be their focus still today and yet they don’t have animal agriculture as their main focus. It’s not even listed on top of their website. Caryn: I remember when I was working with EarthSave—I think it was from 1999 on, early 2000s. The internet was kind of young at the time, but they (RAN) had a lot of information on their website about soy and animal agriculture. And then I remember visiting them again more recently and it was all gone. Keegan: Yeah. And it’s – it’s…why is it? Why is that? You know Green Peace used to have a campaign against Brazilian cattle and now it’s not there. You know, a lot of these organizations actually did talk about it in the 80s and early 90s. And I think that there was a shift – there was a cultural shift that I think the lawsuit against Oprah Winfrey and Howard Lyman really played a role in that. Oprah Winfrey said that she would never eat another hamburger again after having Howard Lyman on her show talking about mad cow disease and they were sued by a group of Texas cattlemen under a free disparagement law. And I think that sent a real shockwave through a lot of media and a lot of organizations that if this industry would be willing to go after the biggest celebrity in entertainment, Oprah Winfrey, over talking ill against their product, well what hope does an organization have? And I think that still resonates through our society today. Caryn: It’s pretty scary. And Chris Hedges touches on it and he called it “inverted totalitarianism” and it can be very debilitating for all of us to feel like we cannot make a difference and if we try to, we can be put in jail or snuffed out. And you tell some pretty chilling stories of what goes on here in the United States and you also talked about some things that have gone on in Brazil in terms of people that have been murdered. Nuns! Keegan: And this is an industry. I mean, as I’m sure most of your listeners know, it’s an industry of violence. It makes its living off of the death and bodies of living creatures. It’s involved in the most destructive forms of environmental degradation on the planet. And so to silence activists, Dorothy Stang, the U.S. foreign nun who was working in Brazil fighting against the destruction of Amazon forest there, you know it’s not far outside their reach. And but then you know here at home, the United States. Animal activists and environmental activists are considered the number one domestic terrorist threat according to the FBI. And it’s because it’s a threat to their industry. And again, these are violent industries and so they’ll use violent repression if they feel necessary. Caryn: And we’re all kind of reeling from the recent terrorist acts in Paris. We’ve had terrorists attack on our own land; 2001, of course, the 9/11 attacks. We have terrorism by our own people in our schools. We have terrorism by white collar crimes by big corporations and yet the ones who have the most difficult law against them is Animal Enterprise Terrorism Act to frighten and scare and prevent animal activists from revealing the horrors that are going on. This is fascism. This is scary. Keegan: Yeah. Yeah, I mean it really shows the power of this industry to dictate legislation and dictate laws in this country. Caryn: Yeah. Anyway, so I’m glad you’re telling this story guys. Keegan: I think it’s a story that needs to get out. People don’t know about the Animal Enterprise Terrorism Act. They don’t know about animal agriculture’s impact and major role in climate change. And so that’s the focus of the film and obviously, the clear focus of the book is to try and get this information out to as many people as possible so that they can make informed decisions on how they think it’s best to live. Caryn: Okay, so you’ve had great results with the film, Cowspiracy. And anybody who hasn’t seen it, you can go on Netflix and stream it anytime. Now you’ve got this book, The Sustainability Secret. And as I said before, for me it’s a great history book. So can we get it into schools? Kip: Yeah, we would love that. We actually—the book is kid of tailored for university students. And that’s where the demographic we were really thinking about because they’re individuals who are starting out their adult lives and have the ability to make decisions hopefully on their own. Getting into public schools was often going to be a challenge because, (1) school boards are very strict on what they allow in and then (2) children oftentimes don’t have the choice to make what they eat. That’s dictated by their parents. So this is really focused towards university students and we’ve love to see it adapted into curriculums. Caryn: Yeah! I could see it working very well in a college environment, because that tends to be a good time in a human’s life where we feel we can make a difference and we want to do something. And then somehow, many of us after we get a job, we kind of settle down and get complacent and buried with bills and taking kids to soccer games. Caryn: Oh, yes! What’s been the reaction so far to—tell me some good news. I mean, we’ve talked about the issues that are covered in the film and in the book are very upsetting. It’s reality, but difficult to take. And now I want to hear reactions, how people are changing the world as a result of seeing your film and reading your new book. Kip: Well what it is, is the timing was so perfect for the film that it was almost inevitable of this transformation that’s taking place so fast. Call it the next step in evolution or whatever you want to call it. You see companies like Hampton Creek, and they do Beyond Egg. They’re now the fastest growing food company in the entire planet, the entire world. Kip: And that’s plant-based food. We are filming. I’m going to Brussels, Belgium in two weeks to show Cowspiracy to the E.U. parliament. And so then I’m going to Paris and the whole climate change and there’s a big gathering there. So the information is getting out there and everybody is just turned on. And it’s—you know—everybody is saying it’s about time and it’s such a relief that the time has come and it’s come just in time. Keegan: Yeah, and we’ve also—the first month that Cowspiracy was up on Netflix, we had over 20,000 people sign up for our 30-day vegan challenge on our website. So it’s inspiring hundreds and thousands of people around the world to look at their diet differently and then 20,000 of them that we know for sure who are actually making that pledge to change their diet. And we hear from people all around the world who are being inspired and are figuring out creative ways to getting this information out to more people. Now Cowspiracy is a tool, and it’s a tool to spread information so people can use it in that way to just get this conversation going and make sure that animal agriculture is at the forefront of the environmental discussion. Caryn: That’s really good news. I’m very happy to hear that. Keegan: We’re – we’re very excited about the European parliament’s screening and then we’ve also had a lot of attention from U.S. senators and legislators from around the United States who are also interested in the film. Caryn: And which senators are those? Keegan: You probably could guess them. Caryn: Somehow I’m not imagining they’re part of the republican party. Caryn: Although there is one. There was—who wrote the book? The republican speech writer for George Bush. His name was Morgan? Gosh, I can’t remember right now. The one republican vegan. Kip: Yeah, he wrote the book, Dominion? Caryn: Dominion, there we go! What does that say about our parties? Kip: Yeah, I mean that democrats have been pretty silent on the issue as well. I mean, Dennis Kucinich was one of the shining lights in U.S. politics for a long time. Caryn: That’s right. Now we have Cory Booker. Well hopefully they’ll watch your film and read your book and start getting real about what we really need going in our government. Because we need government help. I like to say that we should all vote with our dollar and we can all make a difference with the products that we choose to buy. That means for me, not buying any animal products. No meat, fish, dairy, eggs, and personal care products with animal products in it, and clothing (leather and wool and silk). They’re all related and they all involve exploitation and they all destroy the environment. But the government can help tremendously and they need—they can help for those people that are in businesses that involve nonhumane animals. They can provide support for them to transition to something that’s more environmentally friendly and kinder. Keegan: Absolutely. Yeah, we’re already subsidizing animal agriculture to the tune of over $100 billion. We can easily subsidize farmers to instead of destroy the environment, to actually be stewards of the environment. Allow ranchers who are subsidized by the federal government, instead of running cattle, to actually allow that land to come back, to allow land to be reforested to protect native wildlife. And these are all things that could be done with our tax dollars that aren’t being done because of private industry. But that—that could change and I think that’s going to take an awakening of the general public to get behind this message and to push that through government. Caryn: There are a lot of—there’s a lot of numbers in your book, a lot of data, a lot of percentages, numbers that just blow your mind because they’re—you can’t comprehend them. They’re just so big. But one thing I want to talk about, you hit all the issues about food and how it impacts environment and treatment of animals and health. They’re all—everything is perfect. It’s great. I want to just talk briefly about fish because as the mainstream moves along in terms of their cumulative knowledge, I think a lot of people are understanding now that red meat isn’t healthy. They should probably eat less meat. People have been led to believe they should eat more chicken and now, more fish. And it’s going to take a while to kind of get that information into them that fish isn’t any better and it’s so devastating to the environment. Can you touch on some of those realities? Kip: Well one thing you were saying, talking about health alone, that’s actually—I feel kind of a shift away towards fish is happening really fast, especially over the next two years, because of all the studies coming out have been mercury, the radiation, dioxins that are falling out, falling into the ocean. And the accumulation that’s happening into the ocean and into these fish. It’s basically like when you’re eating fish, it’s like Russian roulette. And the buildup. The more you eat, the more it builds up in your body. So from a health standpoint, it’s terrible. Let alone, the omegas—why people eat it—the omegas and the DHA, that has now dropped because you have farmed fish and they’re not eating as much algae as they are and the saturated fat, this cholesterol. It’s just very unhealthy. But then for environmental point of it, yeah the fish, the ocean, as some estimates are—is going to be essentially collapsed by the year 2050. We might see fishless oceans, essentially by the year 2050, which is only a few decades away. And that is scary because the ocean is a living, breathing thing. It’s just like the rainforest, as Paul Watson says, “when the oceans die, we die.” And it’s true. People are just starting to learn how important the ocean is to the entire ecosystem. And most people who really study environmentalism know that that’s the part we need to focus on. It’s the ocean that’s the scary, scary part. And there’s no such thing as sustainable fishing. Sustainable fishing is called: you stop fishing. Caryn: Very important. Now there are people that are focusing on climate change and wanting to quickly get to sustainable energy sources and reduce and eliminate our dependency on fossil fuels. You talk quite a bit about climate change and one thing about the oceans, it is connected to climate change, but it affects the environment on so many more levels. And that’s why when I talk to people about climate change, the importance of going vegan is so essential because if we ever do get to change, get to more sustainable energy sources, the devastation just from fishing and eating animals is going kill us before the climate gets out of control. just kind of push us way over the edge. So, but as you said, it’s not just climate change. It’s the fact that we are destroying forest at an astounding rate, which is going to just only make the issues of climate change even worse. The fact that close to a third of the African sub-Saharan continent won’t have enough water to meet their food needs on a daily basis. It’s the fact that we’re in the largest mass extinction the planet has ever seen. You know, most species are dying now than 65 million years ago when all the dinosaurs died off. And we’re in dire times. And the primary driver of that is animal agriculture. But there is a very big shimmer of positivity. There’s a researcher from University of Illinois and Dr. Sailesh Rao from Climate Healers who have been doing some preliminary research on the ability of grasslands to sequester carbon. And what they’ve found is that if you removed all of the cattle on grasslands that’s formerly forests and allow the forest to come back, we’d be able to sequester more carbon from the atmosphere than we’d put into it in the last 250 years. So basically, we’d be able to reverse all climate change simply by removing cattle off of grasslands and allowing it to revert to forest. And that’s huge. And that will—that buys us the time to figure out how to live more sustainably with renewable energies and get off of fossil fuels. Caryn: That is huge. And it’s very inspiring and kind of flies in the face of those who believe that eating free range animals because it’s more “humane” is far more problematic. Keegan: Dr. Richard Oppenlander who wrote Comfortably Unaware: Food Choices and Sustainability, he writes about that extensively that you know, buying local and organic isn’t going to be enough. And the reality is that right now there is a roundup of wild horses. About 1400 wild horses are being rounded up off of federal land in Oregon to make room for Whole Foods grass-fed beef suppliers. Keegan: This is the whole movement towards grass-fed and sustainable. “Sustainable” is anything but that; it’s actually more destructive. It takes more energy, more resources to raise animals on pasture than in factory farms. Caryn: Yeah, we need to repeat that. All of you folks out there who are trying to eat more plant foods and think that eating fish is okay and eating humanely raised beef and eggs is a good thing, and dairy, it’s not. It’s bad for the environment and it’s certainly not good for your health. And it’s—even though the animals may be treated a little bit better. And even in your book, you talk about how a lot of the farms that are organic aren’t really any different than the ones that aren’t in terms of kind treatment of the animals. The only way to really make a difference is to just eat plants today. Caryn: I’s easy and it’s delicious! (LAUGHING) Well Kip and Keegan, thank you. You’ve done tremendous work. It’s a privilege to be able to speak with you today and to read your book and see the film. And best of luck with the E.U. showing your film and with the climate change talks in Paris. Make change. Kip: Thank you so much. Exciting times. Keegan: Thanks so much for having us. 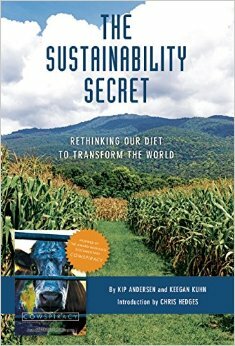 That was Kip Andersen and Keegan Kuhn, and they have a new book out called The Sustainability Secret. And if you’ve seen the film, Cowspiracy, or not, the book is an excellent resource with all the reasons, all the answers why we want you to eat plants. I just have a few seconds left. I’m Caryn. Please send me any messages and comments to info@realmeals.org. Thanksgiving is coming up and that’s a big favorite vegan holiday. And of course, I hope yours is turkey-free. And we’re going to make that easy for you. If you visit responsibleeatingandliving.com, we have wonderful Thanksgiving recipes. We have our Thanksgiving Feast Food Show. It’s fun to watch and the recipes are great. And we have our REAL favorite Thanksgiving recipe. So please check them out. It includes deep dish apple pie and pumpkin pie, all the things that you need for a great Thanksgiving feast. Again, I’m Caryn. This has been, It’s All About Food. Have a delicious week and keep tuning in, love!